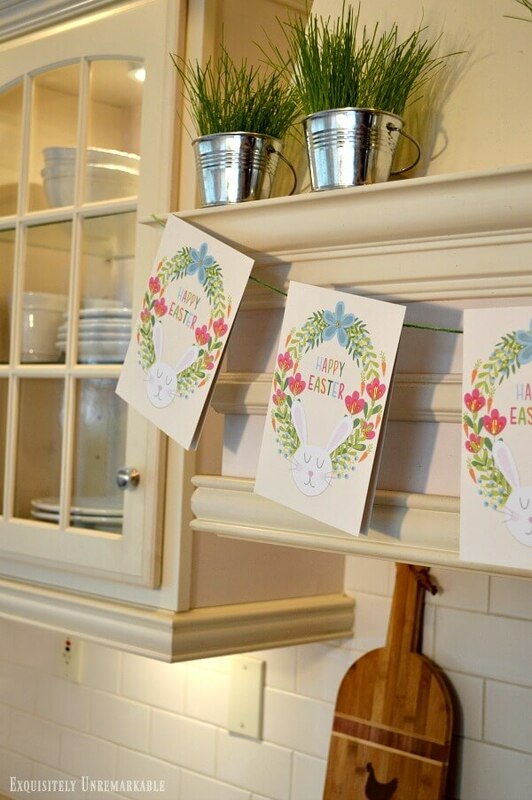 Whip up an elegant Easter banner to decorate your home with discount greeting cards. It's super simple, super lovely and super cheap. 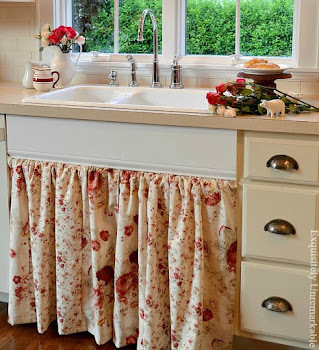 Several years ago, when I first started blogging, I saw a burlap banner decorating someone's home and immediately wanted to make a garland of my own. The only banners I had seen up until that point were cardboard and said Happy Birthday on them. 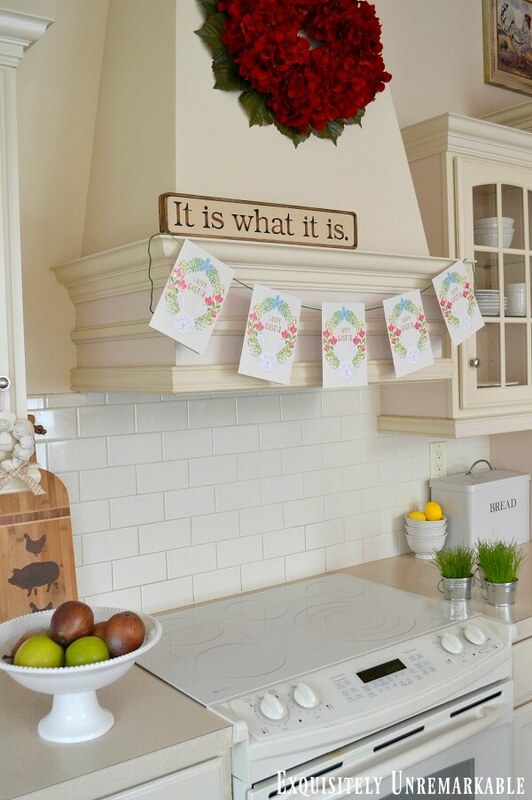 I was inspired by this new-to-me decor accessory, that I immediately dug through my craft closet, grabbed some old puzzle pieces, spelled out the word LOVE and hung it on my kitchen hood. From that day on, I was hooked. Throughout the years, I've come up with some very unique ~ if I do say so myself ~ and very inexpensive banners. They're usually constructed from supplies I have hanging around the house, like old fabric and vintage pot holders or the aforementioned puzzle pieces. The view in my kitchen at night. Well, this banner is a little different. You see, I bought these cards specifically for this purpose. I was at the drug store, saw these darling bunnies and knew they'd look fabulous hanging in my kitchen, as my latest banner creation. And they were 50% off for the pack. Bargain! I'd thought about using them as a focal point and then mixing something else in between for interest, but turns out, they looked so stunning on their own, as I was putting it all together, that I left the accent pieces out. Construction was super simple, as always. 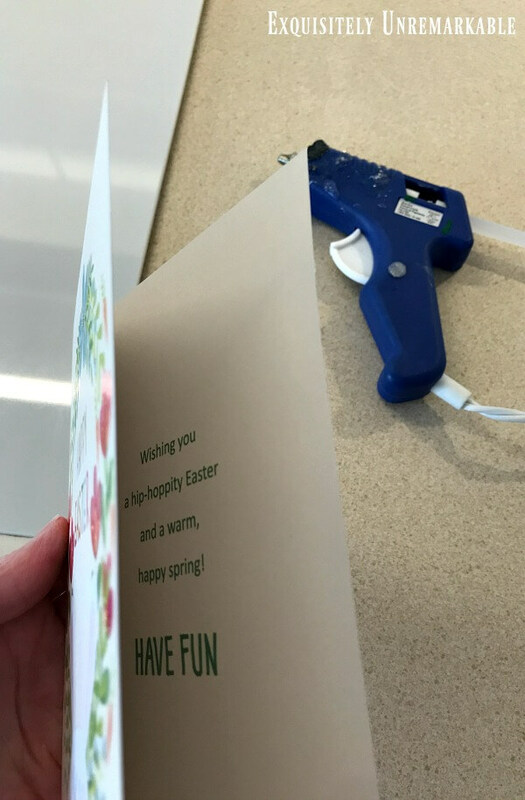 I just grabbed my glue gun and added the tiniest drop of hot glue inside the top corners of each card to keep them closed. 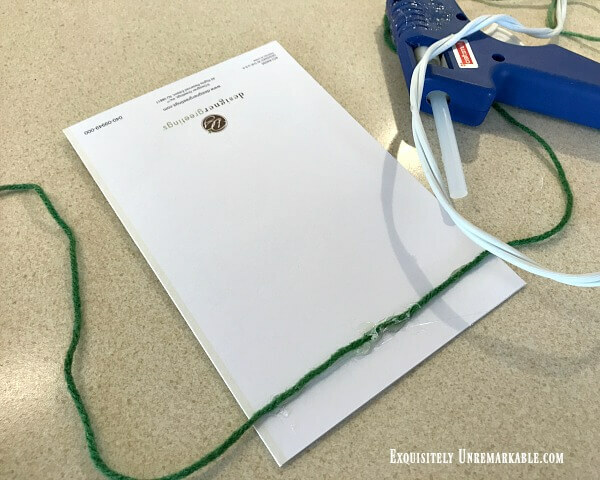 Next, I hot glued the yarn to the back of each notecard so it would hang straight on a piece of yarn. I had all sorts of ribbons at the ready for this project, but in the end, the yarn looked best. The cards themselves were so colorful, I didn't want the ribbon to compete for attention. 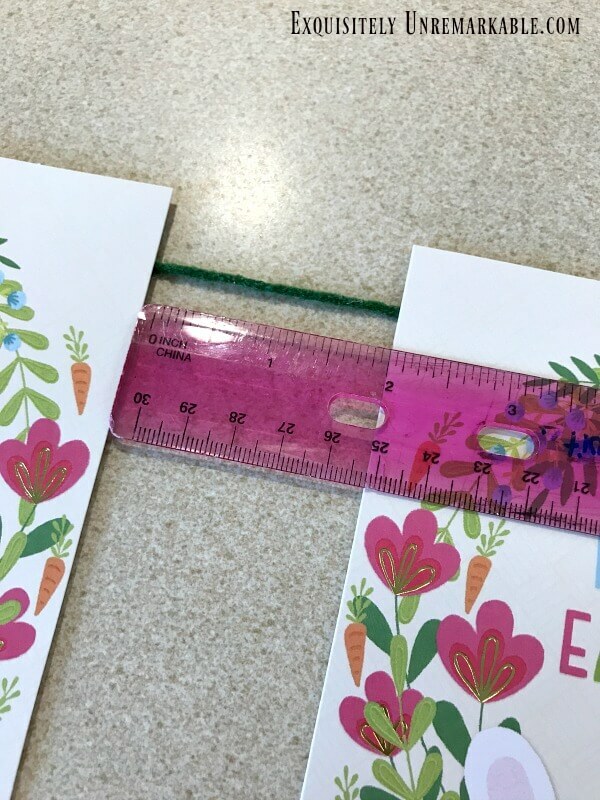 Once I had the center card set, I used a ruler to make sure that the other ones would be spaced out evenly. Then I glued them into place. All in all, it took five cards to cover my hood. Even if I needed more, I probably would've used an odd number since it just looks better with one centered. It also left me with a few cards leftover to send out to family and friend. I love when I get the share the pretty! That's all it took. I hung the yarn up and secured it with tape on each end of the hood. In the past, I have used a drop of hot glue. It rubs off easily when the banner comes down, but this time, masking tape did the trick. My hood is dressed for spring and ready to welcome that Easter Bunny into my home in a few Sundays. In the meantime, I get to enjoy my pastel kissed, elegantly decorated kitchen. I believe the cards cost me about two dollars after the 50% off discount. Of course, I think they look like a million bucks up there. Would you hang up greeting cards as decor? What a cute idea and easy peasy. Love it. Happy Tuesday Kim. Have a good day. Your banners are always adorable, Kim!! I should really make a couple for my mantel....I'll have to keep an eye out at Dollar General for some cute spring decor to make into a banner! 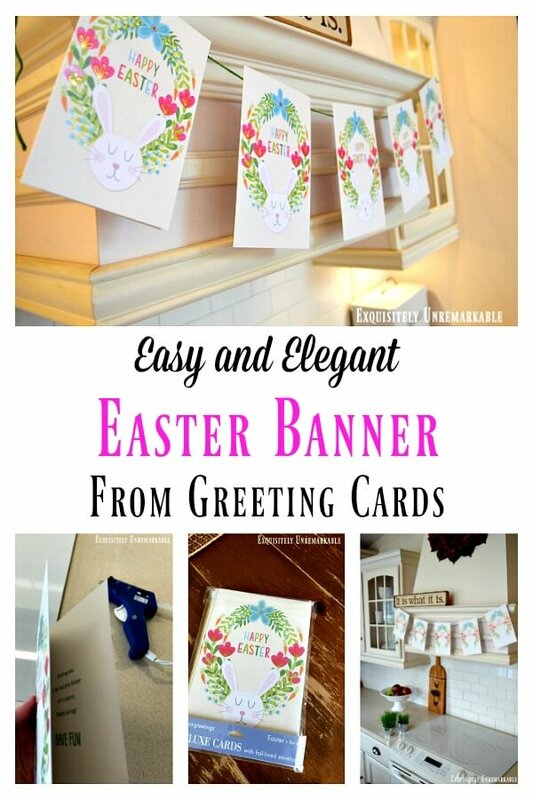 I too love this easy and cute idea for an Easter banner. 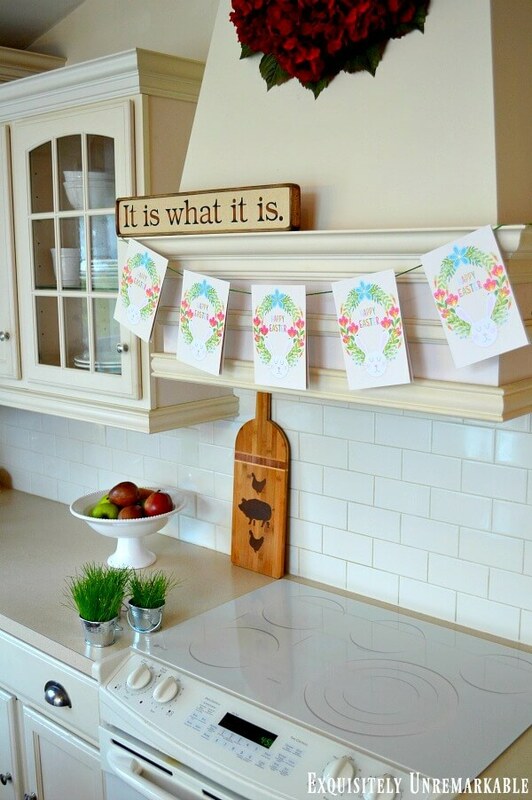 Your kitchen looks perfect with the grass and the banner. My kind of decorating. Very cute, Kim. One of these days I need to make a banner! That's darling Kim! 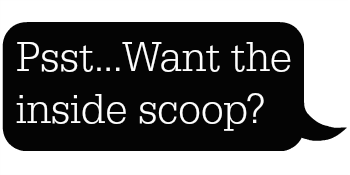 You always come up with the cutest banner ideas! That banner is absolutely adorable! I love the soft look...and you truly cannot beat that price...not even at the Target Dollar Spot! :-) Love and hugs! Very cute cards. Love your banner. I bet cooking is a little sweeter having those adorable bunny faces above the stove. I've totally used greeting cards as decor, mostly Christmas cards. Every year I save one or two favorite cards and display them again the following year. 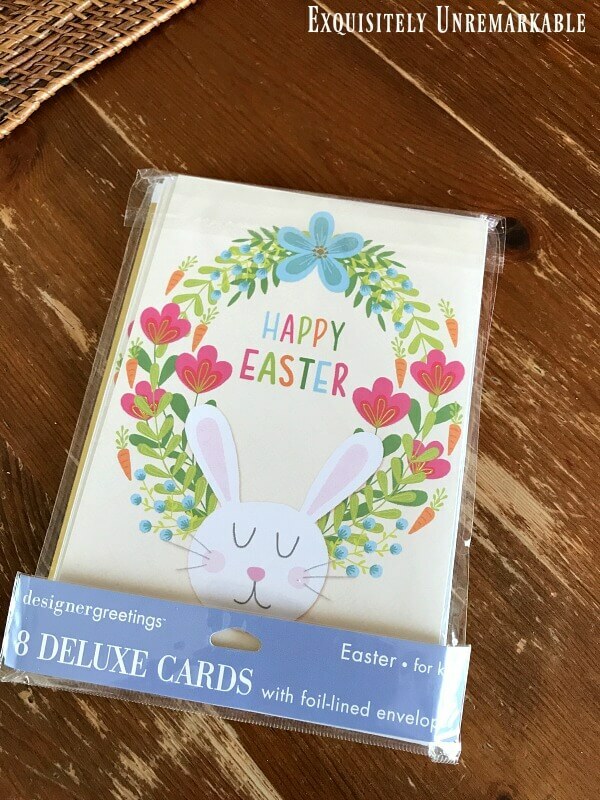 This is a great idea, you can even use old easter card. I love it!! Very Clever idea!! That is such a fun idea Kim. And the best part is it will not take longer than five minutes to put it together. Happy Easter my friend!